Taunton has massive potential for more cycling and walking journeys as an alternative to short car trips. Fifty percent of trips in Taunton are less than 2 miles. 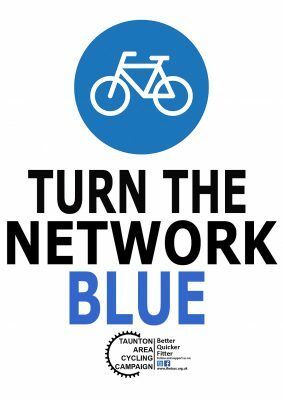 More cycling and walking would help reduce congestion, cut pollution, improve health, give people more reliable journey times, and save them money. It would give freedom and independence to some of the thousands of people who don’t have access to a car, particularly young people and children. An efficient transport system will support the economy. Somerset County Council tends to favour road schemes when bidding for capital funds for transport. Over £40m has recently been spent or is planned for road schemes. We are asking their the next major scheme is a cycling and walking network project. 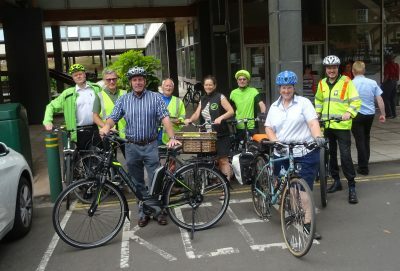 Cllr John Woodman, cabinet member for Highways and Transportation took up our invitation to join a ride around some the cycle network in Taunton. Accompanied by public health and highways officers and members of TACC, Cllr Woodman experienced for himself the good, the bad and the ugly of the cycle routes and highway design in the town, following a circuit from County Hall, via Wellington Road, French Weir, Trenchard Way, Winkworth Way, Duke Street and the Parade. Among the problems highlighted were discontinuous cycleways alongside main roads, where people on bikes have to give way to minor roads, and difficult junctions at Compass Hill and Priory Park roundabout. An old but very good piece of cycleway design was highlighted at Winkworth Way, where there is a separate cycleway and pavement, a design preferred by both cyclists and pedestrians to the more recent shared pavements approach. 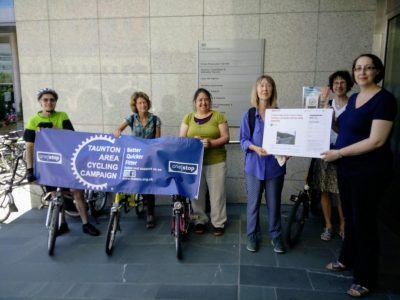 The tour also highlighted the need to connect the network where there are missing links, to enable people of all ages and abilities to cycle without fear of fast moving and heavy motor traffic. It was also an opportunity for Cllr Woodman to try an e-bike for the first time, kindly loaned for the day by Nationwide E-bikes on Priorswood Road.